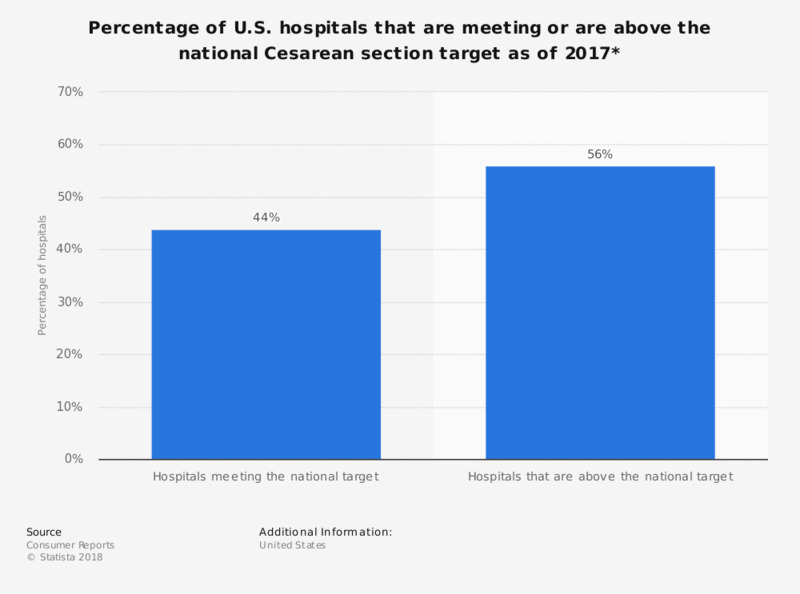 This statistic depicts the percentage of hospitals in the United States that are meeting or exceeding the nationally acceptable rate for Cesarean sections (c-section) among first-time, low-risk mothers as of 2017. According to the data, just 44 percent of U.S. hospitals are meeting the national target for c-sections. The current target for C-section births at U.S. hospitals to low-risk, first-time mothers is 23.9 percent. However, the actual average rate in the U.S., according to most recent data, is currently at 25.8 percent. * Target is for first-time mothers-to-be who should be at low risk for a cesarean: pregnant women expecting just one child (not twins, triplets, or other multiples) and whose baby is full-term and is positioned head first—the position least likely to require a C-section. The U.S. national C-section target for first-time mothers with low-risk deliveries is 23.9 percent.